Texas Attorney General Greg Abbott has declared the Democratic Health Care Reform Bill unconstitutional and describes it as "pure political payoff." As a follow-up to my previous article, Buy My Vote Ben Nelson Asks Attorney General To Call Off The Dogs, wherein I praised the efforts of South Carolina Attorney General McMaster, I must add to my list of those to be commended Attorney General Greg Abbott from my home state of Texas. The Texas Attorney General is out in front of the effort to derail Harry Reid’s Senate health care reform bill, calling the bill a "Uniquely contemptible case of vote buying." I include myself among the millions of people who agree with Abbott’s eloquent assessment of the Nebraska Compromise. Last night on Sean Hannity’s Show on the Fox News Channel, Hannity interviewed the Texas Attorney General. Abbott, who is one of twelve state Attorneys General who are attacking the Senate Health Care Bill based on the constitutionality of the bill. Although Abbott is spearheading an effort to stop House and Senate Democrats from passing the bill, he is doing so with no apparent political bent. Instead, he is pursuing a course to defeat the bill strictly according to the highest law of the land: the Constitution of the United States of America. His position is, therefore, unimpeachable. During the Hannity interview, Abbott declared the Senate health care bill unconstitutional. Abbott described deals made by Senate Majority Leader Harry Reid to insure passage of the bill as "pure political payoff," and called the deal between Reid and Senator Ben Nelson (Democrat-Nebraska) a "uniquely contemptible case of vote buying." In further explaining how the bill is unconstitutional, Abbott told Hannity that the bill violates fundamental principles of non-discrimination. It is utterly fascinating to me that liberals and socialists, as a group, are joined by the entire Democratic Party in showing disdain for the Constitution. 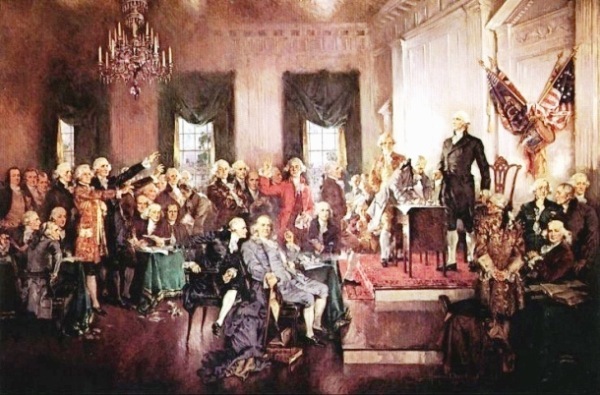 To those Democratic Senators and Representatives who care so little about the Constitution they swore to defend, millions of Americans join me in this supremely simple message: the men in the picture above, who risked their lives to form this Republic, cared a great deal about the Constitution. You, on the other hand, are violating your oath. We, the people, insist that you pack. Get out. You’re gone in November. To the Texas Attorney General, I say don’t be dissuaded Mr. Abbott, there are millions of us standing with you.